A friend of mine shared an experience with me. She had been invited to a dinner party with a group of professional athletes. At some point during the dinner, she needed to excuse herself from the table. When she stood up, she froze, perplexed by what was happening. Every man at the table had just stood up with her. It took my friend a moment to realize that these men had adopted in their social circle a practice of honor that has long since been abandoned by many, to stand when a lady enters or leaves the room. My first reaction to this story was to roll my eyes. Where do these guys get off bringing back some ancient custom? Was it just a ploy to be different? It was weird. But then I thought, this custom came from a time period in history when society was so determined to honor people, that they adopted a code of conduct to express it. These gentlemen were simply instituting a simple practice in their circle to uphold the same value. What if our entire society became so committed to honor one another that we adopted a code of behavior that reflected that commitment? Then again, outward expressions of honor are pointless unless they stem from a genuine heart that places value on other people. So what does honor look like today? Honor starts in the heart. We can stand up when a lady leaves the room. We can address elders with titles of respect. We can hold the door open. But none of it means a hill of beans if our heart isn’t postured right. Honor means to value. Dishonor means to treat as common. True honor begins with a decision to value someone more than yourself. Don’t put the cart before the horse. Develop honor in your heart. The code of conduct will follow. Spouse – Writing a note to show appreciation for how they handled something. Boss – Looking for ways to help make their job as a leader easier. Pastor – Showing up to Church on-time, ready to soak in every word. Friend – Taking time to understand what they’re going through. Politician – Saying a prayer that God will help them lead. Parent – Asking and weighing their advice in a difficult decision. Just a thought, what if we rebuilt honor in to our society? What would it look like? Would it benefit us? What do you think? These are great questions and suggestions, but what can we do to better honor God as well in a cultural society? 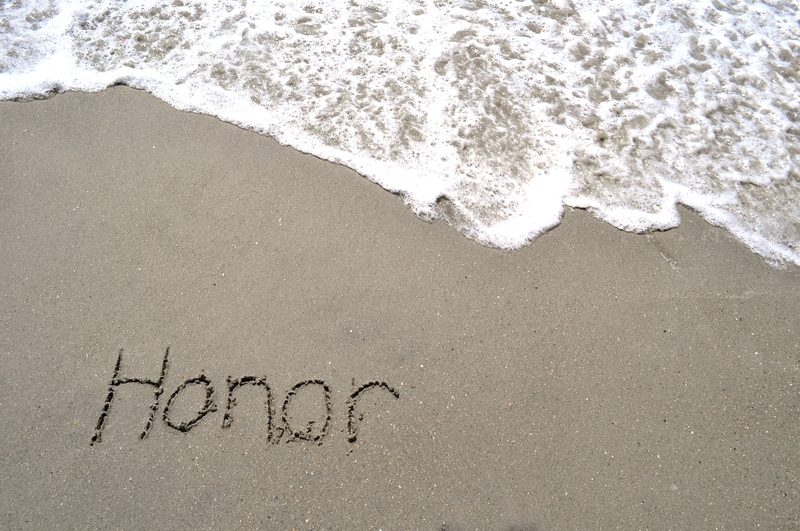 Honor- a powerful yet much unused word today. by the way- you have been following my blog Mosaic- I am in the process of transitioning to a new wordpress.org site. Please stop by and connect with me there! I would challenge your comment that we should honor others more than ourselves. Personally I believe we cannot give to others what we do not have ourselves. In scripture it says to Love your neighbor as you love yourself, not more than you love yourself. When we love others “more’ than we love ourselves, things get out of wack, we get burned out and can get resentful. But, if we honor ourselves by loving ourselves first…taking care of ourselves, doing things we need to take time to do for ourselves, then when we reach out, we come from a place of being full instead of empty. Thanks for the comment Donna! I agree. We are no good to others unless we have something to offer. I’ve met a lot of people, though, who think they’re not ready to communicate honor and love for others b/c they don’t feel completely whole themselves. I like your perspective b/c the goal is to love others. The reason you want to take the time for yourself is so you have something to give. In a way, that is still preferring others, it’s just recognizing you’re no good to them unless you’ve taken care of yourself. Thanks for bringing the balance!